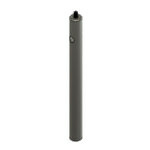 12.7mm diameter, 150mm length stainless steel post. One end of each post is tapped with M4 threads, and the other with M6 threads. Each post is supplied with an M4 set screw. Posts are warranted by the manufacturer for 5 years if used according to the instructions. The sole remedy is repair or replacement of the defective product or, at the manufacturer's option, a refund of the purchase price. Defective or incorrectly shipped products are cheerfully replaced. The manufacturer handles all other return requests on a case-by-case basis. There may be a restocking charge. Some items or quantities may not be returnable at all. All returns must be pre-authorized by Machine Vision Store and shipped with freight pre-paid. Please contact us to request authorization and instructions. The item's serial number and associated sales order number will be needed.